ONE of the freshest looks in floor coverings is al least 200 years old. 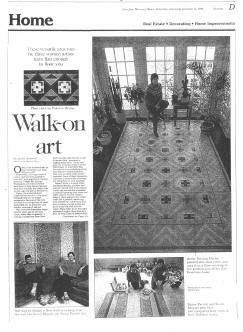 Floorcloths, area rugs made of canvas that has been painted or stenciled, were popular in Colonial America. People like George Washington and John Hancock used them in their homes because they were durable, less costly than woven rugs and just as decorative. Today, the materials have improved but the idea is the same. Although they are no longer inexpensive because of the time involved in creating them by hand, floorcloths are an attractive and durable example of folk art. Artist Patricia Dreher painted this floor cloth, and uses it as a floor covering in the kitchen area of her San Francisco home.